As you may (or may not) know, surveyors are required to complete continuing education every year. 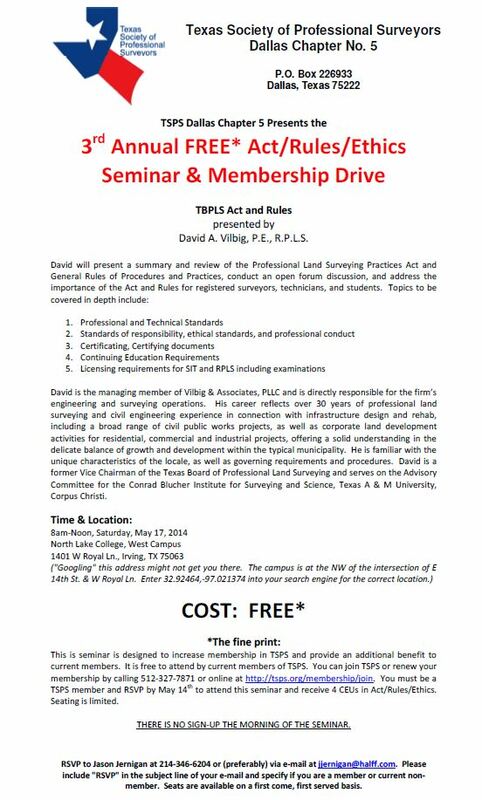 Vilbig & Associates managing partner, David A. Vilbig, P.E., R.P.L.S., will present the TSPS Dallas Chapter 3rd Annual Free* Act/Rules/Ethics Seminar. David will present a summary and review of the Professional Land Surveying Practices Act and General Rules of Procedures and Practices, conduct an open forum discussion, and address the importance of the Act and Rules for registered surveyors, technicians and student. Click the image for a printable pdf flier with RSVP details. David is directly responsible for our engineering and surveying operations. His career reflects over 30 years of professional land surveying and civil engineering experience in connection with infrastructure design and rehabilitation including a broad rang of civil public works projects, as well as corporate land development activities for residential, commercial and industrial projects, offering a solid understanding in the delicate balance of growth and development with the typical municipality. 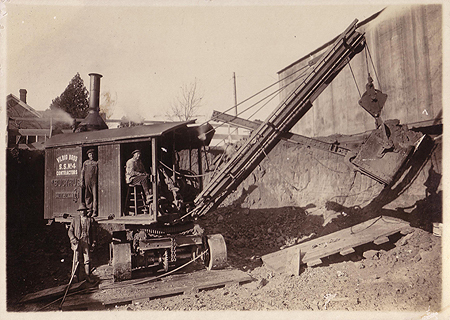 He is familiar with the unique characteristics of the locale, as well as governing requirements and procedures. David is a former Vice Chairman of the Texas Board of Professional Land Surveying and serves on the Advisory Committee for the Conrad Blucher Institute for Surveying & Science, Texas A&M University, Corpus Christi. *Free for TSPS members. Renew your membership online at http://tsps.org/membership/join You must be a member & RSVP by May 14th to attend the seminar. Seating is limited! RSVP to Jason Jernigan, see flier above for details. This entry was posted in Ethics, Presentation, Surveying and tagged Ethics, Survey, surveying, Surveyor, TBPLS, TSPS on May 6, 2014 by Jennifer Vilbig. To send us an e-mail, please fill out the form here.